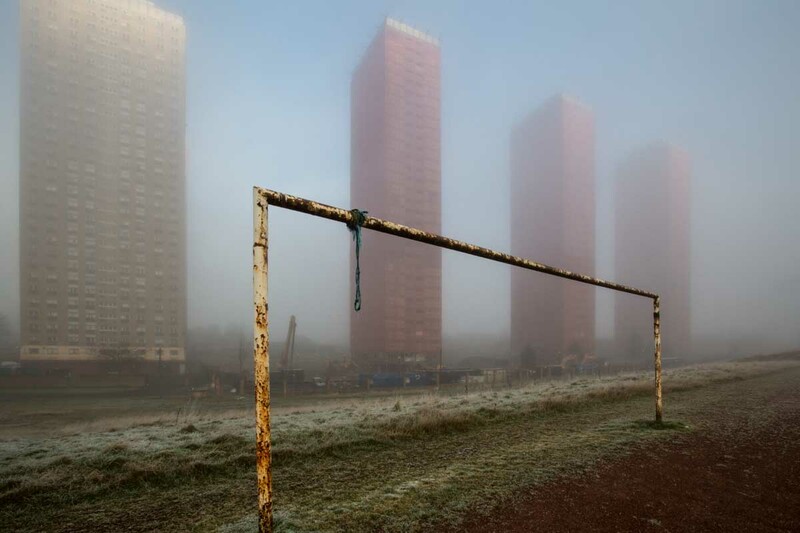 “I always just presumed the Red Road Flats would last forever, but when you see it now in this state you realise its over. 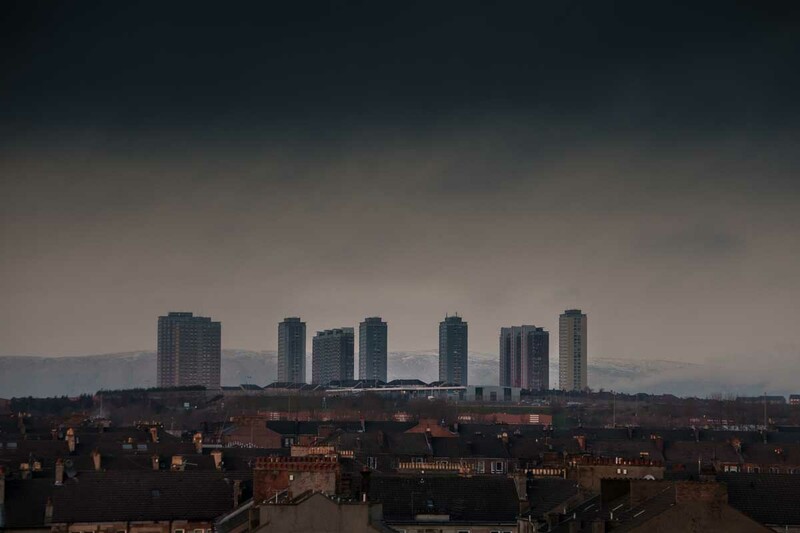 It’s not the actual building itself, but its all your memories, that’s where I was brought up, that’s where I was made.” Born and brought up in the Red Road flats, Finlay, like everyone else in Glasgow, had witnessed the flats’ long slow demise. 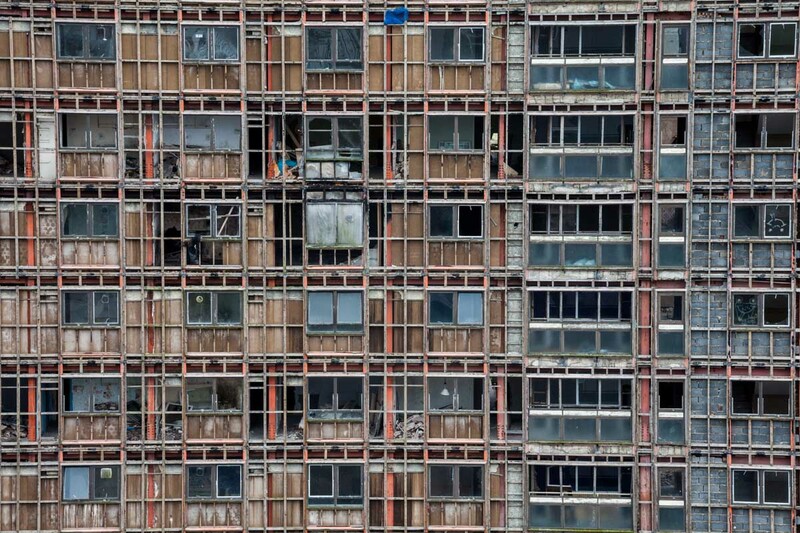 It took several years to prepare the flats for demolition, stripping them back to their former skeletal state. When the first double-slab block was demolished in 2012, people then realised that this was the end. 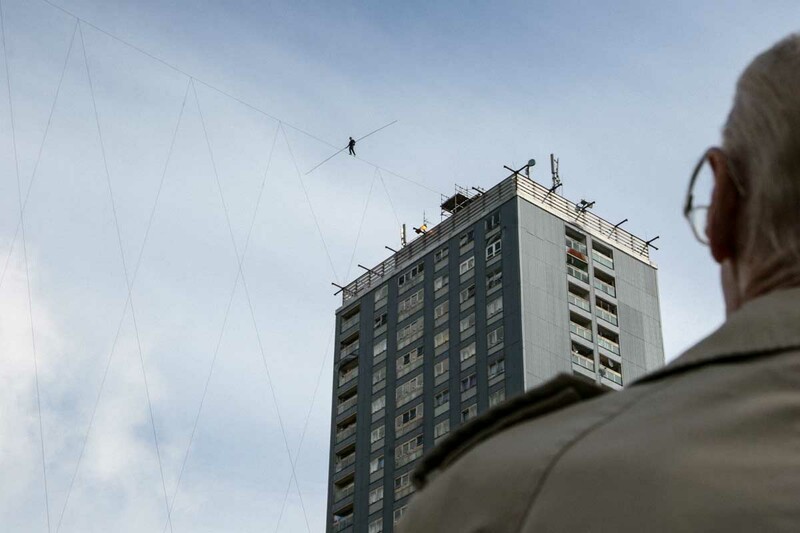 I had first ventured into the Red Road in the summer of 2007 to witness the French tightrope walker Didier Pasquette’s failed attempt at crossing between two of the flats. 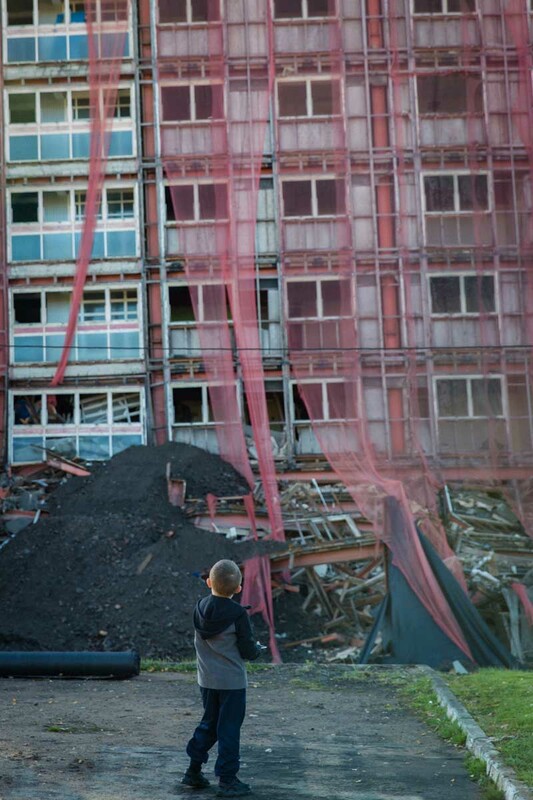 By then the process of emptying the flats of residents was underway and the countdown to demolition had begun. The afternoon event was billed as a community carnival but local residents, some decanted from their own flats for ‘safety’ reasons, wondered what all the fuss was about. 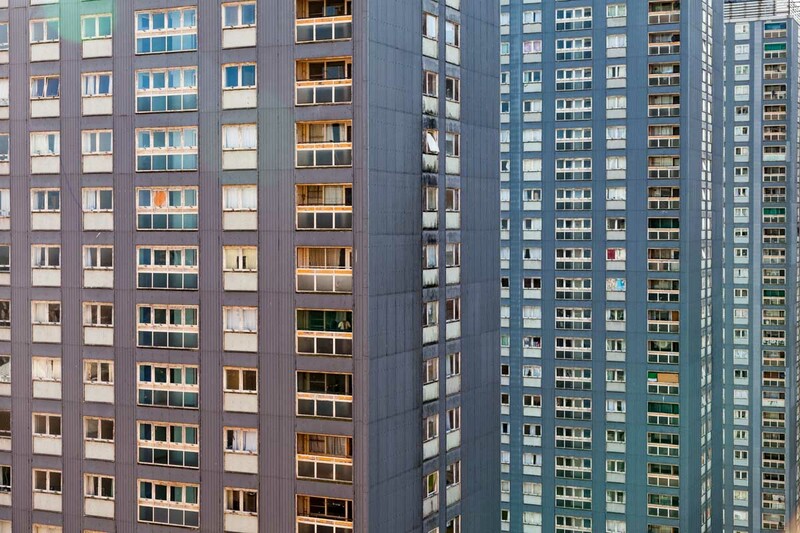 Questioning all of us strangers with cameras, and the ‘bloody eejit’ on their 30-storey home rooftop, they wondered what made their homes so interesting. 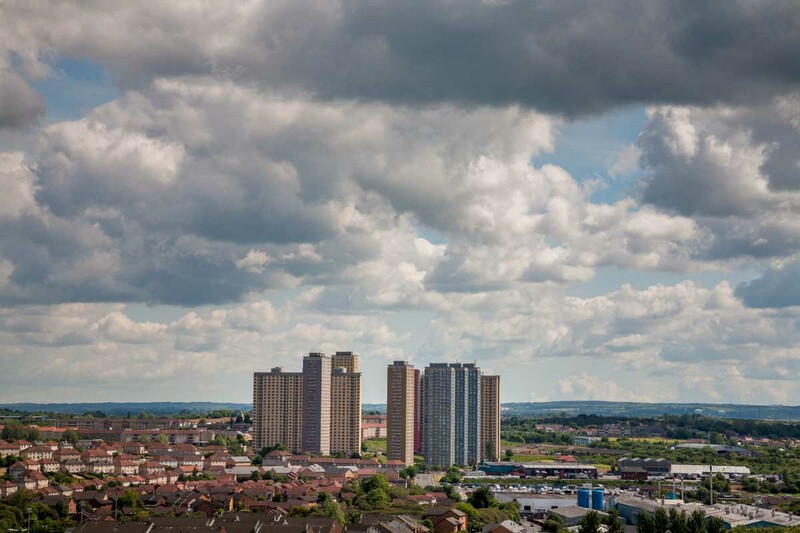 For me, one of the strangers with a camera, the Red Road flats proved addictive. The long death notice served on the flats allowed for plenty of time to document their last days/years. As time passed and the flats emptied, and with two blocks already demolished, I spent weeks and months photographing everything and anything that was connected with Red Road. But there are only so many ways to photograph high-rise flats from ground level and I was close to exhausting them all. I knew I had to get another viewpoint, I needed to get a way inside, I needed to get underground. 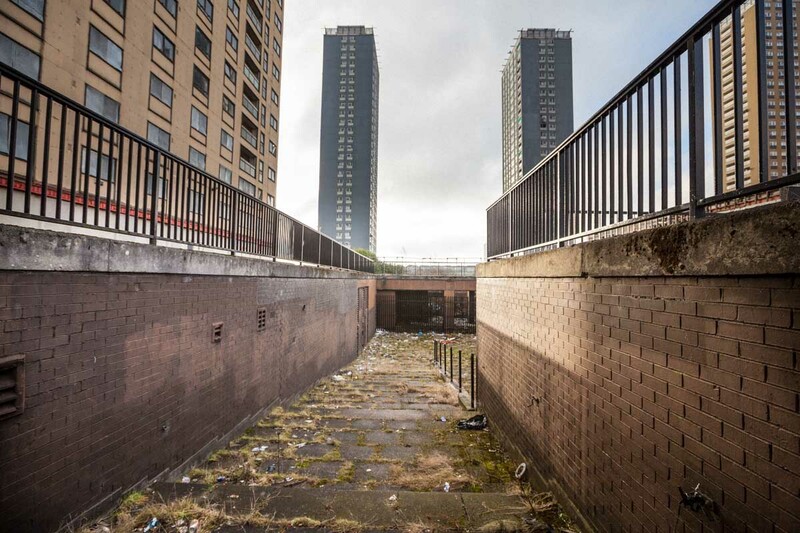 I had heard rumours, perhaps an old wives’ tale that there was another ‘underground level’ to the Red Road flats that had been closed off since the late 1990s, some kind of shopping centre and complex, I was told. 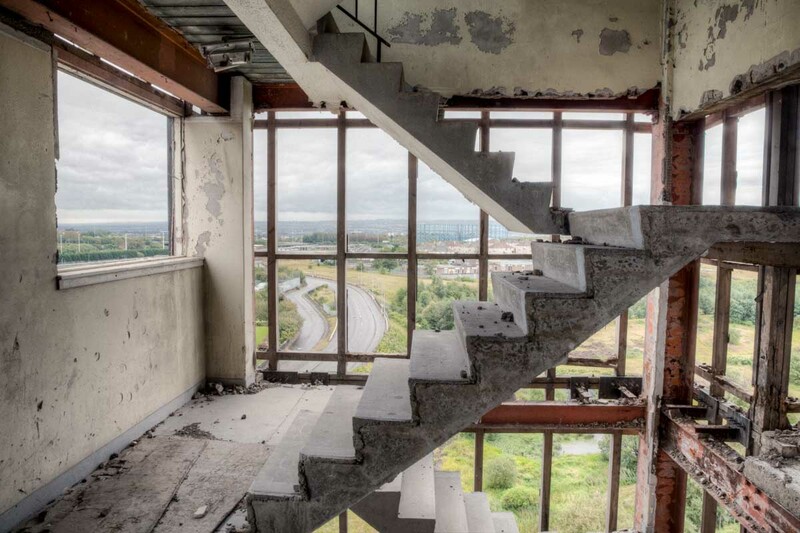 In 2011 when the demolition crews needed access it was opened for a brief period to reveal an abandoned and hidden underground ‘bunker’ that once served as the ‘local amenities’ for the small town of 4,700 people who once occupied the flats. 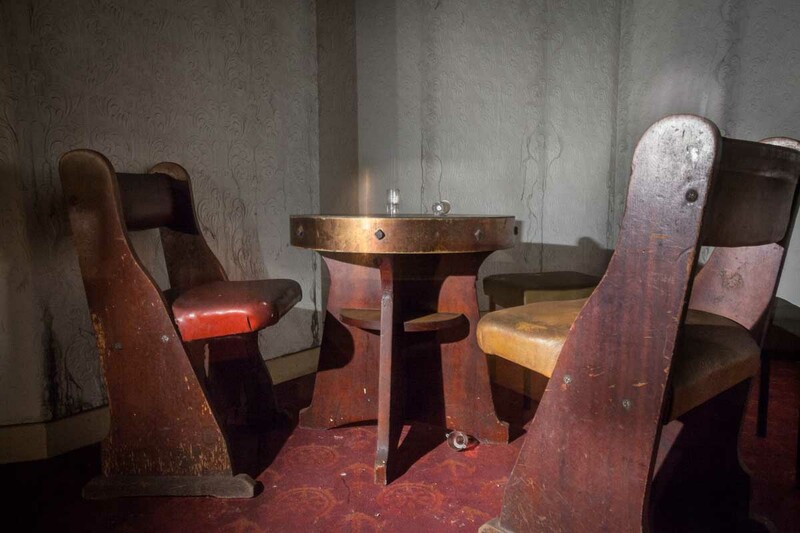 This underground world consisted of a nautically themed bar called The Brig – a local pub like no other, without windows, with a boat-themed decor, wood-panelled walls and compass tables – like a modern-day Wild West saloon. 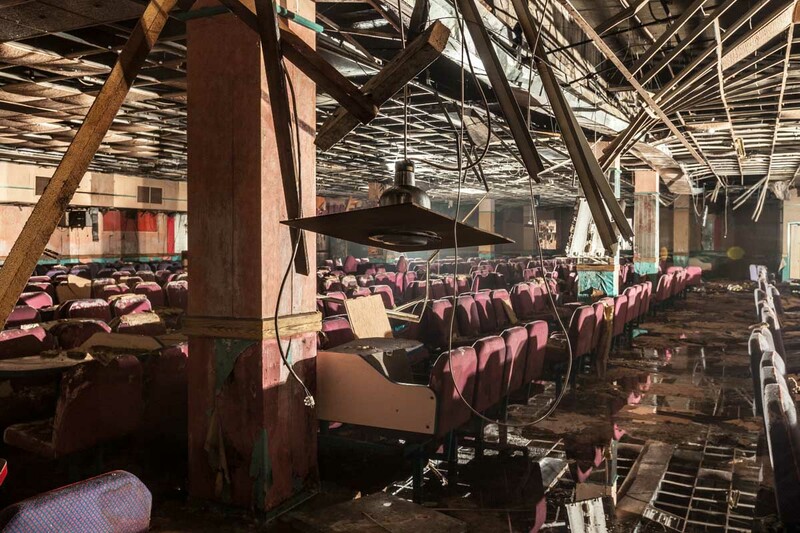 Next door to the Brig was a staggering 1,000-seater Mecca Bingo Hall, a favourite haunt that enticed Red Road’s ladies to gamble away their meagre fortunes, day and night. Completely flooded and partially damaged by fire it still managed to retain its grandiose interiors of sparkly mirrored pillars and bold red and blue colour scheme. It was an Aladdin’s cave, full of Red Road objects and treasures and memories. 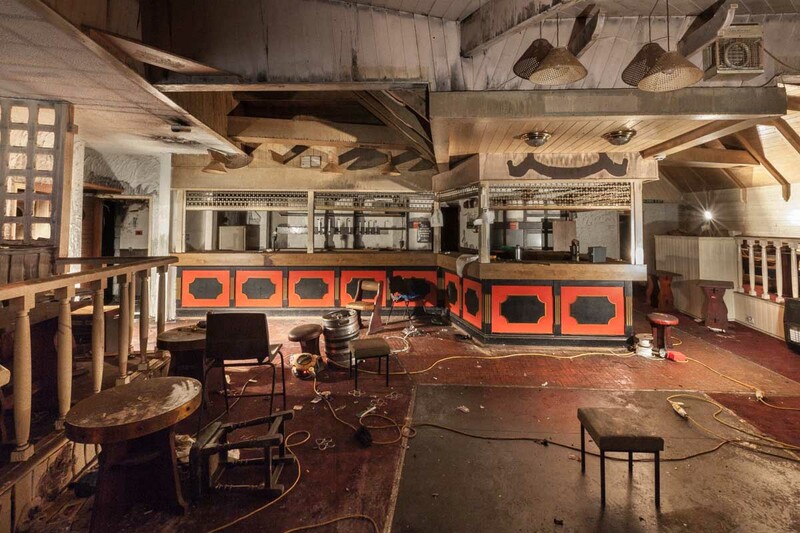 I would spend only a few hours inside the Bingo and Bar but then spent months collating and recording its stories afterwards with former residents. For one Red Road resident – Boab – the Brig Bar’s most precious memory was that this is where he bought his first pint as a 15-year-old: “It was the first pub I had ever been in and with no windows or daylight it was like Las Vegas, you didn’t know when to stop drinking.” Bingo fanatic Helen would spend up to 4 hours a day in the bingo – afternoon and evening – gambling away her wages: “It was a very friendly place, everyone knew everyone as we were all neighbours. 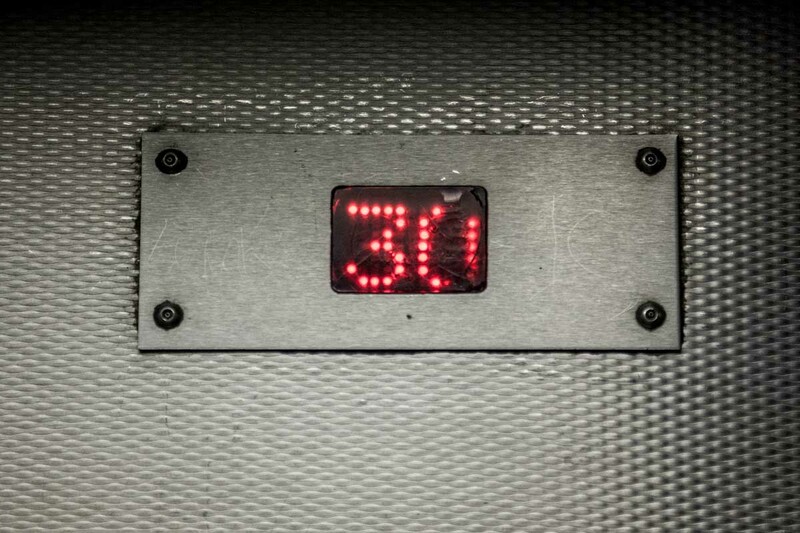 It was a place that we felt was ours.” Such was the grandness and scale of the Red Road bingo hall – it became a true Mecca for many of North Glasgow’s pensioners and buses would bring them in from across the city on weekend nights. 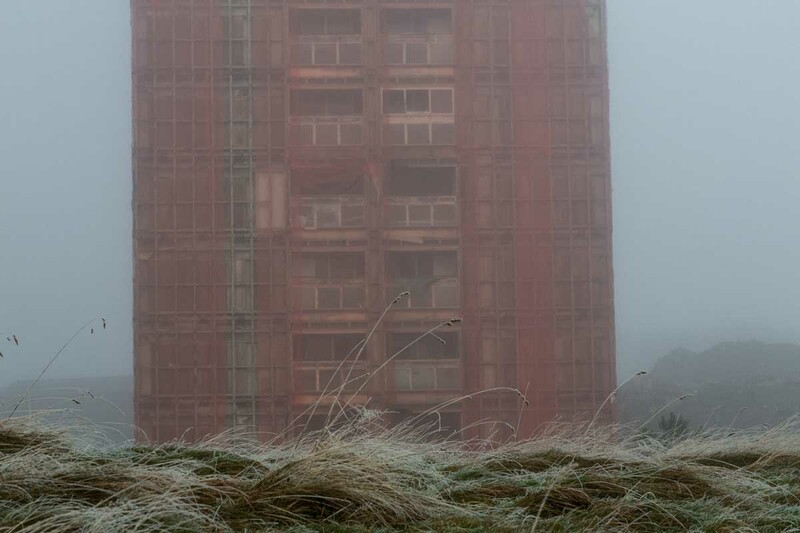 As the Red Road flats began their demise, so too did the Red Road Underground. Flooding at street level led to dampness in the bingo, residents started to move away and those replacing them had no time, money or need for bingo or dodgy underground pubs. When the Red Road Underground closed in the late 1990s there were very few original tenants left to remember what was there. 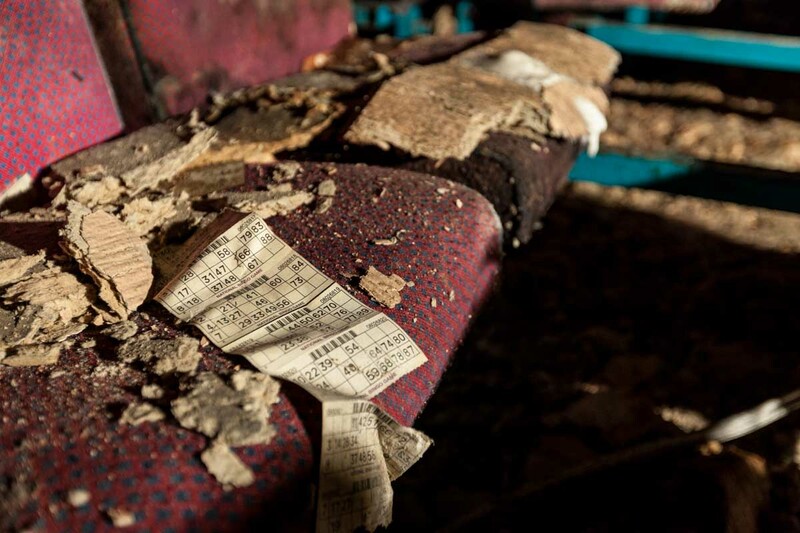 But for local people who lived near Red Road from 2011 onwards, its hidden underground bingo halls and romantic notions of a former community that once existed in the flats offered little interest or solace. The prolonged state of dilapidation of the flats was nothing more than an embarrassing blight and eyesore on their landscape. 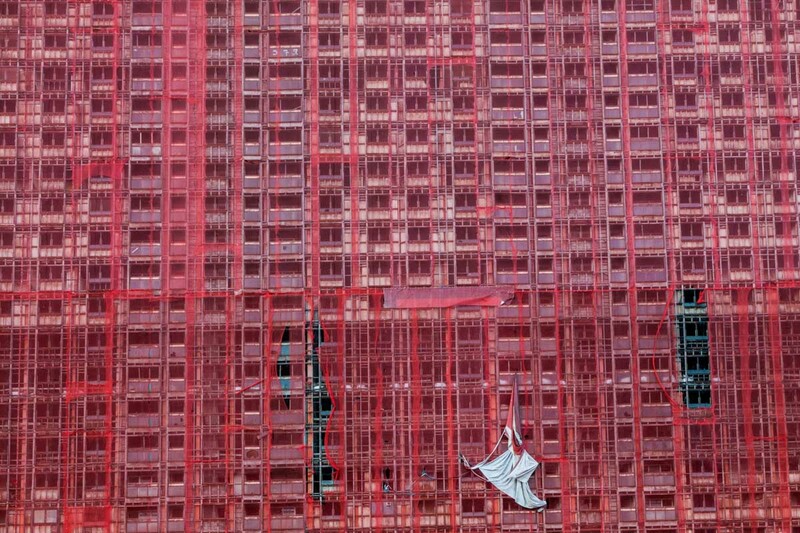 For several years its skeletal structures, draped in red mesh like flesh wounds over broken bones, stood defiant as the City Fathers pondered how to get rid of all of the remaining flats and start afresh. 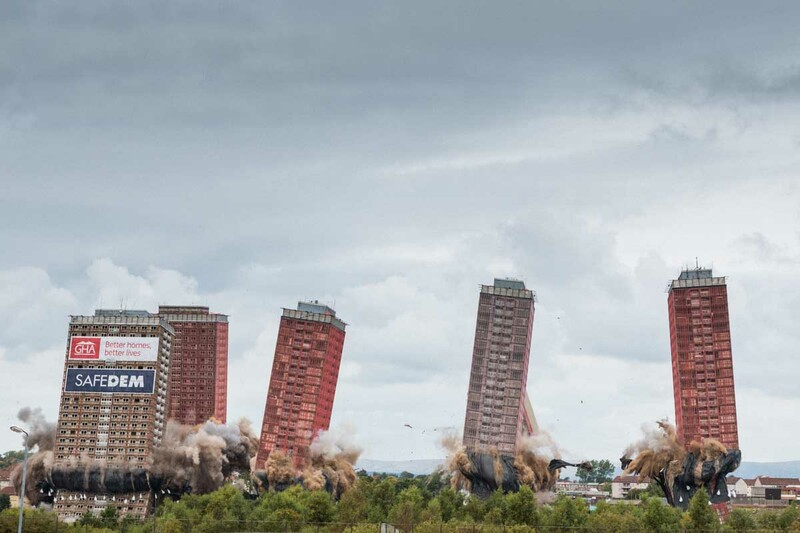 Then along came an idea to blow up the flats for the opening ceremony of the 2014 Commonwealth Games. 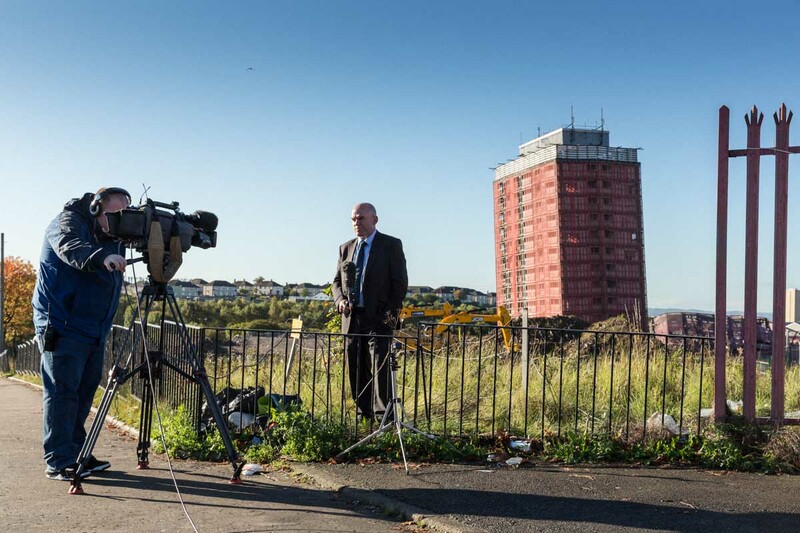 The Red Road flats were back in the spotlight once more. 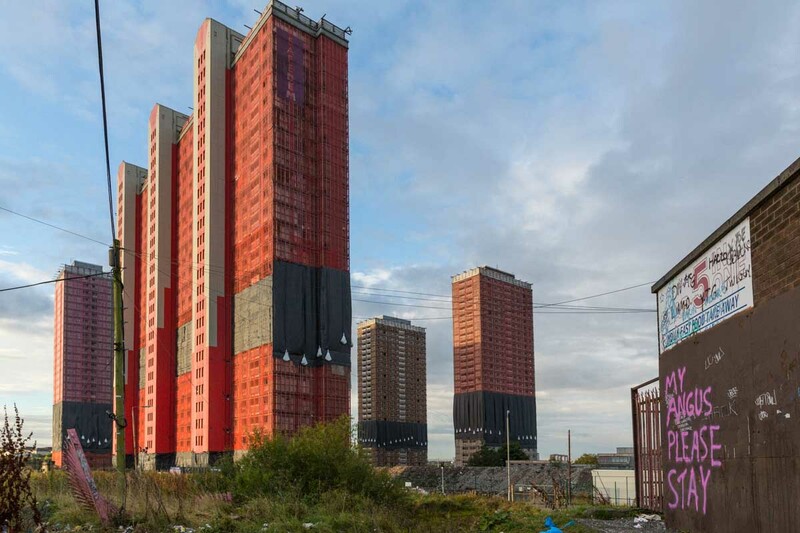 Glasgow City Council and its respective Commonwealth Games partners had thought it would be a great spectacle to demolish all 6 remaining flats for the opening ceremony, televised live to a projected billion viewers. They argued that the demolition would herald the rebirth of the city, and show the ‘New Glasgow’ to the world. In the end the plan was scrapped for ‘safety’ reasons, backed by a 17,000 strong petition against the proposals. 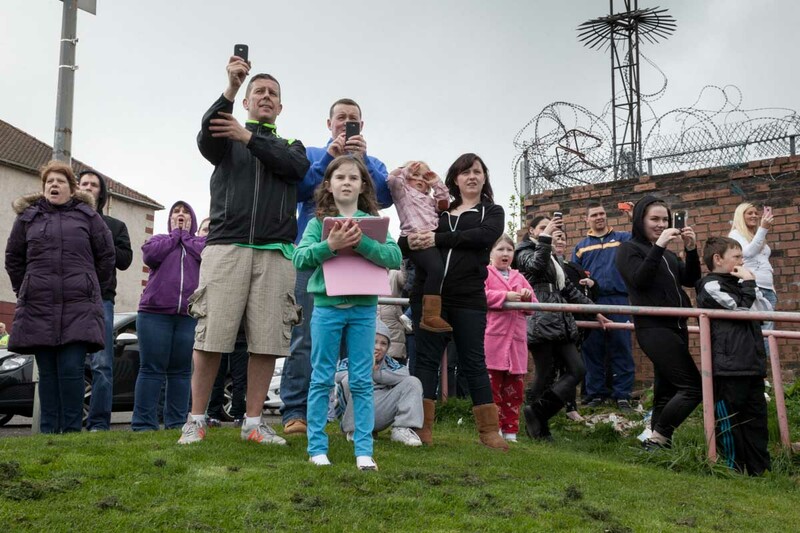 Some people clearly felt blowing up a failed social housing scheme to celebrate a mega sporting event to be in bad taste, especially given that one block was still full of residents. The residents of the last inhabited block were all asylum seekers, lost souls from all corners of a troubled world seeking sanctuary in a condemned building. 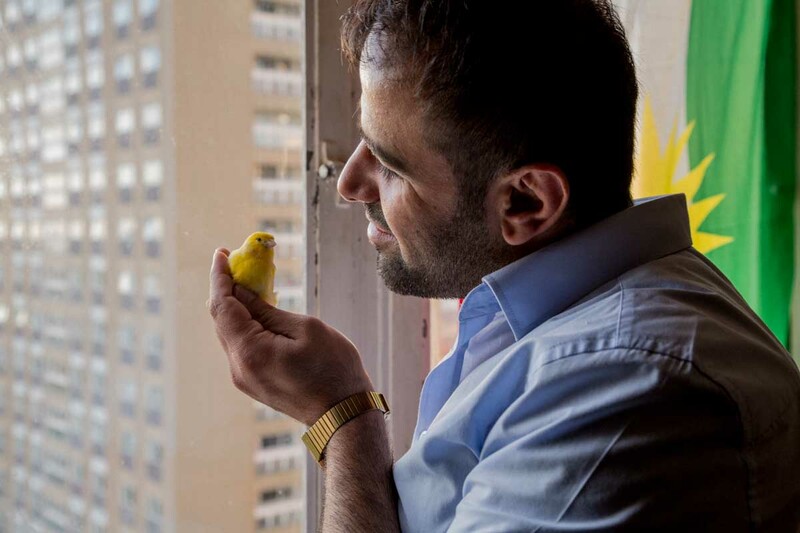 Jamal, the so-called Bird Man of Red Road, a destitute asylum seeker from Iraq, had lived in one other block alone for 8 months with only two canaries for company. 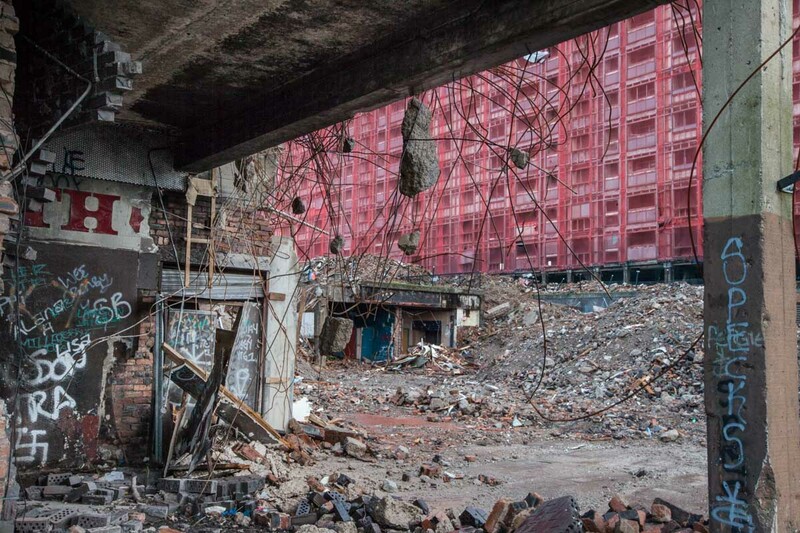 Whilst the rest of the buildings around him lay derelict and pending demolition, he refused to leave his flat, knowing that had he done so, he would likely have been deported from the country. 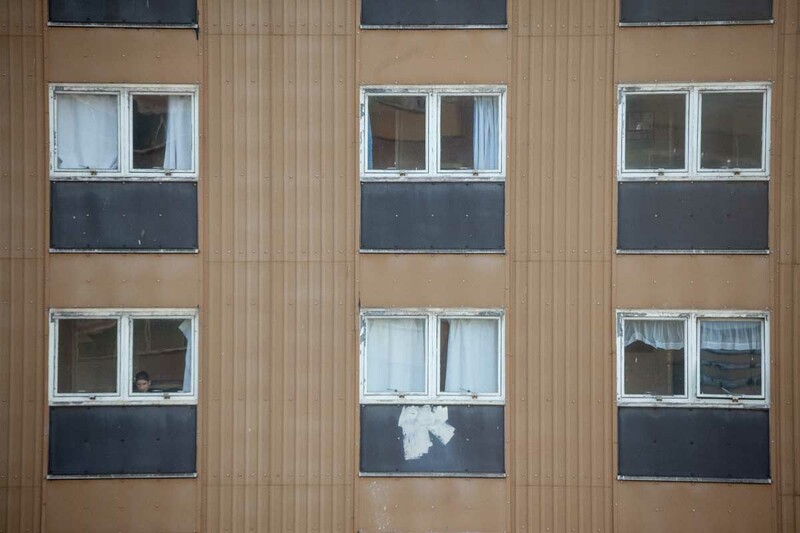 By the end of 2014, the last remaining inhabited block still had several hundred asylum seekers crammed inside at full capacity. 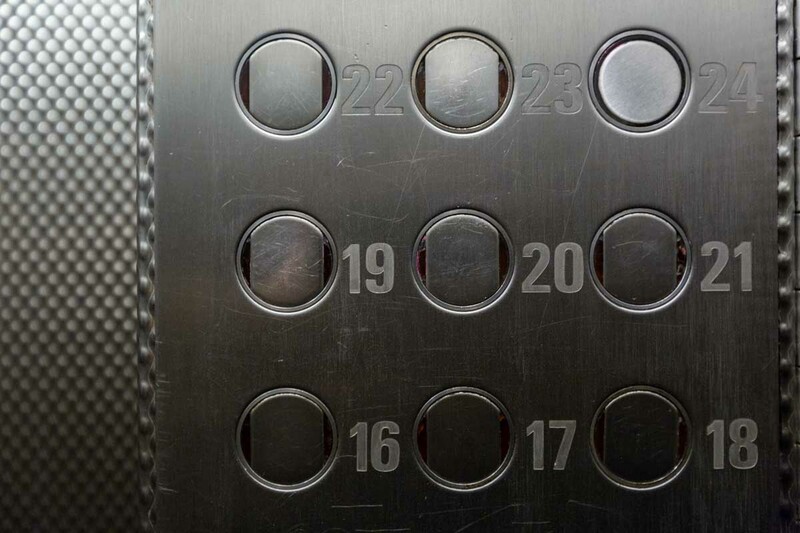 The flats were now damp, infested, their drains blocked and the main lobby stinking of sewage. 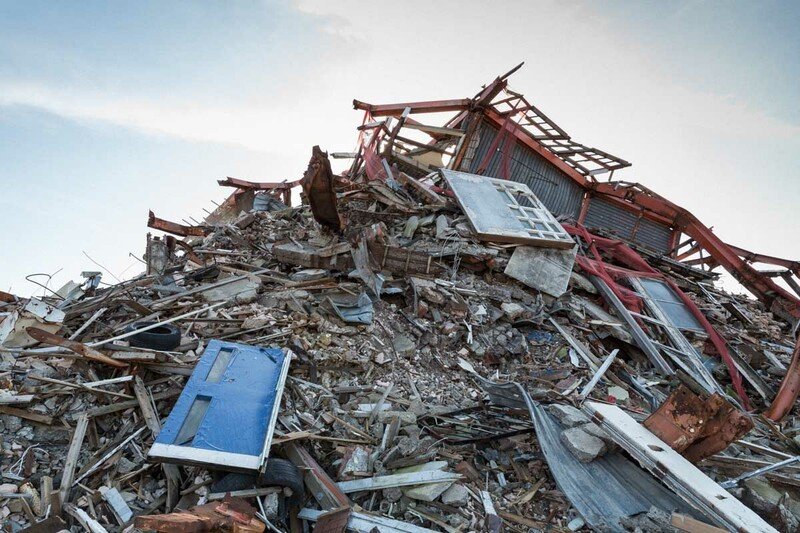 Their sanctuary was disintegrating from the inside and no-one was going to undertake repairs on a condemned building with the clock already ticking. With no-one else wanting to house the asylum seekers from this block in ‘their area’ this last remaining inhabited block bought Red Road a few more months’ survival. 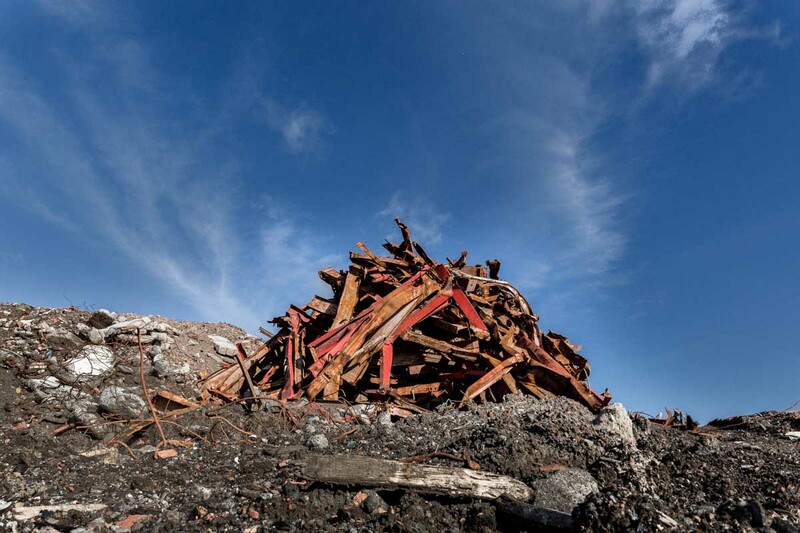 In the spring of 2015 the asylum seekers were at last dispersed across the city and the last remaining block completely emptied, bringing 48 years of residency at Red Road to an end. 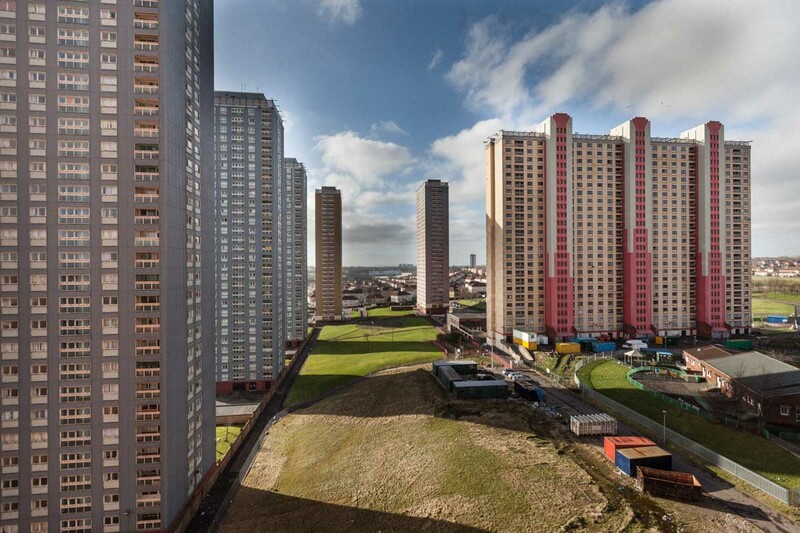 When the Red Road flats were first constructed in 1967 they were seen as the utopian answer to the city’s pressing housing shortage and the clearance of the worst slums in Western Europe. 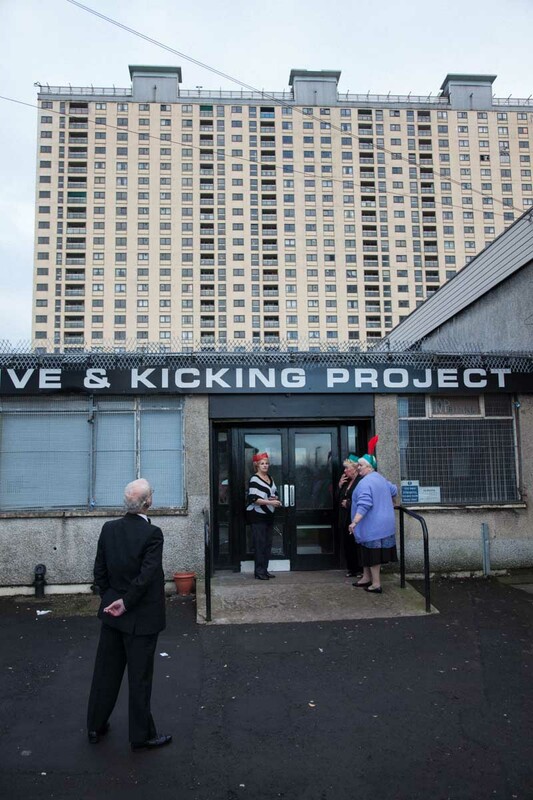 Its first residents were given central heating, double glazing, indoor toilets and mixer taps. One Conservative councillor even claimed the flats were ‘too good’ for the working class. Nearly fifty years later and, for these last residents, utopian dreams had become a dystopian nightmare. On Sunday 12th October 2015 the remaining six blocks were finally demolished in a set of controlled explosions lasting less than ten seconds. 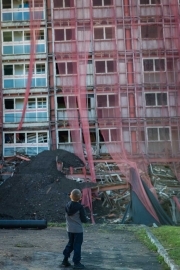 When the dust finally settled a few minutes later, two of the blocks remained partially upright, much to the annoyance of the demolition crew, the City Council and Glasgow Housing Association. Red Road it seemed was going to hold on for just a wee bit longer, giving Finlay and others a little more precious time with their memories.